It’s not every day that you catch the eye of a “modern-day icon” in your industry, but that’s exactly what happened to us when we launched VOLT Instant Beard Color at the International Beauty Show in Las Vegas in June. BaBylissPRO Master Barber and Educator and owner of Major League Barbershop & Academy Jay “Majors” Raposo (@jay_majors) stumbled upon us as he was scouting for interesting, innovative products to take back to his businesses. Our booth and brand grabbed his attention initially, but it was Instant Beard Color’s performance and flexibility that made him want to collaborate with us on a deeper level. The result is this awesome video produced by Jay and his team at his shop in West Haven, CT. 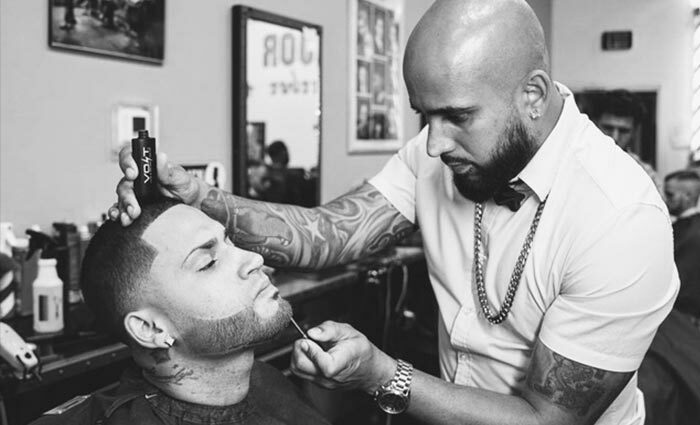 Check out all the ways Major League barber Eliezer Santiago (@joitobarbero0) uses Instant Beard Color to amp up the in-chair experience. From using it to create the look of a fuller beard to sharpening up his already razor-sharp edges, it’s a great example of how Instant Beard Color can be used at shops and salons across the country. Serving the barber and salon professional community has always been a top priority for us since our early product development days. If you’re a shop owner or freelance pro, check out our Wholesale and/or VOLT VIP programs today to see how we can partner together to bring lifeproof grooming to your clients. If you’re planning on attending the LV Barber Expo on Sunday, Sept. 30th, drop by our booth! We’ll have Instant Beard Color testers for you to use, live demos going all day and VOLT swag. Come see us at booth #206. Video shot and edited by Johnny Rose (@Johnny_Rose).